As we move towards the end of the year, it is time to reflect on all the work put into the writing of this blog by Everything Dinosaur team members. Over the last twelve months or so, a further 369 articles have been published on this blog and just for a bit of fun we thought it would be interesting to look at the top ten most popular articles posted. How we have calculated the most popular web log articles is based on a combination of factors such as total number of comments placed, number of emails received, requests for further information, Facebook likes, Google pluses and of course things like re-pins and the posting up of our work onto other platforms. Naturally, we have tried our best to remove any bias from the listings. For example, an article posted up in January has more chance of getting into the list compared to a feature put up much more recently. The top ten certainly cover a variety of subjects. Naturally, there was a lot of interest in articles to do with Everything Dinosaur model reviews, or news of 2014 additions to model collections but lots of dinosaur themed and palaeontology based topics get into our top ten list. So without any further fuss, here is the top ten blog articles for 2013. 7). New research into dinosaurs’ paternal habits and behaviours makes it lucky number seven for the Dinosauria in our top ten. The article, which postulated that the males may not have played a very significant role in brooding the young was published on the Everything Dinosaur web log in May: Dinosaurs as Devoted Dads? 4). All the way back to January 2013, for our number four, an article on some of the latest research from the Lark Quarry site with its multitude of dinosaur tracks. This new study suggests that the tracks were not made on land at all, but they were created as the various dinosaurs made their way through a body of water: Dinosaurs not Stampeding but Swimming? Dinosaurs going for a dip! Our blog post showed pictures of the new Pachyrhinosaurus dinosaur model (see below), as well as images of the very striking Theropod dinosaurs Monolophosaurus and Suchomimus. Looks like dinosaur model collectors are going to have a busy year next year. 1). So what is the number one, the article that came out on top of our 360 plus articles published on the blog this year? Ironically, our top post is related to the “Post” as Everything Dinosaur’s work on the Royal Mail stamp set featuring 150 years of British palaeontology and geology takes top spot. A set of first class stamps. Everything Dinosaur team members often get asked to help out with dinosaur themed projects, our work with Royal Mail must have been “first class”, as we received lots of comments, feedback and emails about this work. We even got a set of the special stamps included within a special presentation folder. So there you have it, our top ten blog posts for 2013, look out for more articles in the next twelve months or so. No doubt 2014 will provide us with a huge array of dinosaur discoveries, new models, amazing fossil finds, museum exhibitions and so on to write about. A team of scientists from the Royal Ontario Museum (Canada) working in collaboration with a number of other Canadian palaeontologists have announced the discovery of a new type of Dromaeosaur from the Hell Creek Formation of Montana (United States). The Dromaeosaurs are fast running, relatively small, carnivorous dinosaurs that flourished during the Cretaceous period. This new genus, known from fossilised teeth as well as upper jaw material (maxilla) and lower jaws (dentary), lived at the same time as Triceratops and Tyrannosaurus rex. The fossils represent the latest Dromaeosaurid known from North America (Maastrichtian faunal stage) and a phylogenetic analysis reveals that this dinosaur is perhaps more closely related to Late Cretaceous Asian “raptors” such as Velociraptor (V. mongoliensis) and Tsaagan (T. mangas) rather than to North American Dromaeosaurs that lived in the Campanian faunal stage. This new predator has been named Acheroraptor temertyorum. It was most probably feathered and around 2.5 to 3 metres in length, perhaps weighing as much as forty kilogrammes. It probably hunted small mammals, birds, lizards and other small animals whilst avoiding the attentions of the much larger apex predators the Tyrannosaurs. It may also have scavenged the kills of T. rex. Acheroraptor (pronounced Ack-ear-oh-rap-tor) means “Acheron Robber or Plunderer”, the genus name being derived from Acheron, the River of Pain in the underworld of ancient Greek mythology, along with the Latin word “raptor” – plunderer or robber. The species name honours James and Louise Temerty who have financially supported the palaeontology department of the Royal Ontario Museum. A detailed paper outlining the new discovery, and the implications for the Hell Creek Formation and its fauna, has been published in the scientific journal Naturwissenschaften. The size of the jaws plus the isolated teeth found in the Hell Creek Formation in the past, indicate that Acheroraptor was relatively large for a Late Cretaceous Dromaeosaur. It was certainly bigger than the better known, and perhaps more famous Velociraptor (which was about the size of a turkey). It had long been suspected that Dromaeosaurs existed alongside the likes of Triceratops and Tyrannosaurus rex but apart from numerous isolated teeth, there was no definitive proof of their existence until this new fossil material was prepared and described. The strongly curved, quite large teeth with distinctive serrations (denticles) had been known from the Hell Creek Formation for many decades, but in the absence of fossil bones, researchers did not have the material available to help them to understand the evolutionary relationships between this Late Cretaceous Dromaeosaur and other members of the Dromaeosauridae from the northern hemisphere until now. Studies of more abundant fossil material from Asia suggests that Acheroraptor, which roamed North America around 67-66 million years ago is more closely related to the long-snouted Velociraptorines of Asia than it is to earlier North American Dromaeosaurids. This suggests that even very late in the Cretaceous there was extensive migration and mixing of different species from Asia and North America. Analysis of Acheroraptor’s teeth in the context of a larger sample of small meat-eating dinosaur teeth suggests a decline in Dromaeosaur diversity in North America just before the end-Cretaceous extinction event. It is important to distinguish Acheroraptor from “Archaeoraptor”, the generic name given to a composite fossil that was at the centre of a scandal a few years ago. A fossil found in China had an article published in National Geographic magazine which claimed this was a transitional, “missing link” between birds and fast-running Theropod dinosaurs. Prior to the article being published in this prestigious publication, doubts had been raised about this fossil, as it seemed to show a long-tailed dinosaur with feathers and wings. Phil Currie was one of the scientists asked to examine the fossil material and this specimen was eventually proved to be a forgery. It was actually a clever composite made up of several fossils skilfully glued together. The tail was later identified as belonging to Microraptor spp. but the legs, feet and toes belonged to an entirely different creature, very probably a prehistoric bird. The Archaeoraptor scandal, a fossil forgery that fooled a number of leading scientists highlighted the illegal fossil deals that take place in some parts of the world. As a result of this scandal, one that ended in humiliation for a number of academics and for the National Geographic magazine, there have been calls for much more scientific scrutiny of vertebrate fossils. Now that the both the human (H. sapiens) and the Neanderthal (H. neanderthalensis) genomes have been mapped and fully documented, any research into genetic variation in modern human populations permits scientists to trace the origins of gene types back into the history of hominin evolution. A large scale study of people living in Latin America has revealed that their increased risk of diabetes could have been inherited as a result of modern humans interbreeding with a Neanderthal population. In a paper published in the academic journal “Nature”, scientists from Harvard Medical School (Massachusetts, United States), working in collaboration with the Max Planck Institute for Evolutionary Anthropology (Leipzig, Germany) and the Broad Institute (Massachusetts), carried out a large genome-wide association study (GWAS) on a sample of more than 8,000 Mexicans and other people from the Latin American population. The research mapped the genomes of the study sample and sought patterns within the genes in a bid to identify different traits and characteristics. The team found that a variant on the genetic make up of the population, a gene form named SLC16A11 which when present in a genome, predicates those in the population to a higher likelihood of getting diabetes. This gene form has also been identified in a study of genetic material extracted from Neanderthal bones found in a cave located in the Altai Mountains, Siberia (Denisova cave). It can therefore be speculated that since the Denisova remains pre-date the evolution of modern man, this genetic trait which makes part of the population prone to type 2 diabetes may have been inherited as a result of interbreeding between ancient Homo sapiens and Neanderthals. Could Neanderthals Have Passed On To Us the Gene Responsible for a Higher Risk of Diabetes? Previous studies have shown that non-African modern humans carry a portion of Neanderthal (and Denisovan) genetic material in their genes. The proportion of Neanderthal is usually less than 2% but can be approaching 4% in some groups of Europeans. It had been thought that inherited genes from another member of the human family tree were present as H. sapiens shared a common ancestor with H. neanderthalensis, the common ancestor is believed to be Homo heidelbergensis, but the percentages were just too high for this fact to explain it all. The higher than expected levels of inherited genetic material in modern populations could only be explained by interbreeding between the two closely related species sometime in our recent past. It is likely that interbreeding between populations took place whenever these species came into close proximity and can perhaps be linked to movements of ice sheets and inter-glacial periods permitting migrations and the geographical spread of hominins. It is known that people who carry the higher risk version of the gene are twenty-five percent more likely to have diabetes than those who do not have this gene type. Modern humans who have inherited copies of this gene from both parents are fifty percent more likely to have diabetes as a result. This higher risk gene (SLC16A11) has been found in nearly half of people with recent Native American ancestry, including the Latin American population. This study into the gene pool of Mexicans and other members of the population with a Latin American ancestry has shown that this population is at particular risk of diabetes. The higher risk gene, SLC16A11 is rarely found in genetic studies of European and African populations. Scientists have been able to use knowledge of the genome of some species of hominins to map the routes of genetic inheritance. The routes and pathways are proving to be more complicated than previously thought due to the interbreeding that seems to have taken place between species. The functional implications of such inherited genetic material is only just beginning to be understood by researchers and geneticists. The higher risk gene (SLC16A11) is part of a group of genes that code proteins for the transport of metabolites around the body. These metabolites are involved with the human body’s various chemical reactions. A spokesperson from Everything Dinosaur speculated that the gene could have evolved as a result in changes to our ancient ancestors diet. Changing the levels of SLC16A11 can change the amount of a type of fat that has been implicated in the risk of diabetes. This new study indicates that SLC16A11 could be involved in the transport of an unknown metabolite that impacts on the fat levels in cells and therefore increases the risk of type 2 diabetes. It is very likely, that more insights into the origins of our genetic make up and the genetic variation seen in human populations will be revealed in the next few years as more ancient hominin fossil material is analysed for the presence of genetic data. Twas the night before Christmas, when all through the house, not a creature was stirring, not even a Mussaurus! Our apologies to Clement Clarke Moore, but as we are about to close the offices on this Christmas Eve, one final posting on the web log before the big day – a prehistoric themed Christmas tree. It is worth noting that most modern families of conifers (including those that contain the ones that are used as Christmas trees), evolved in the Mesozoic, during the age of dinosaurs. Although a number of ancient types of conifer did go extinct towards the end of the Cretaceous Period. However, the origin of the conifers goes back a lot further. It is thought that the first conifers, as a type of gymnosperm, evolved in the Carboniferous Period. 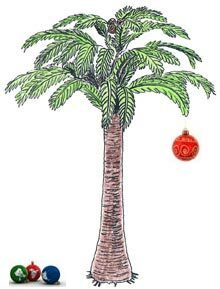 Next time you look at a Christmas tree, consider how the first trees of that type probably evolved more than 330 million years ago. Since the dinosaur experts at Everything Dinosaur created their downloadable calendar for 2014 at the beginning of the month, we have been hard at work emailing all those who requested one. With 2014 just over a week away (this year seems to have whizzed by, faster than a speeding Struthiomimus), there is still time to get your prehistoric animal themed calendar for the start of the New Year. Everything Dinosaur has produced a simple, colour in calendar which features various drawings of prehistoric animals and prehistoric scenes. Each page of the calendar has a month on it and above the dates there is a prehistory inspired picture for young palaeontologists to colour in. Artist friend and fellow dinosaur buff, Mike Fredericks has helped with a lot of the layouts and the prehistoric animals featured include Stegosaurs, horned dinosaurs, flying reptiles, Plesiosaurs and of course Tyrannosaurus rex. Free dinosaur calendar to download. Once you have the download, it is just a case of simply printing off the pages, (fourteen, one for each month with front and back covers) and your calendar is ready to be stapled together and coloured in. If you like the way in which Everything Dinosaur tries to encourage people to learn about prehistoric animals and if you are on Facebook, please look us up (click on the Facebook icon below) and give Everything Dinosaur a “like”. Just in time for Christmas comes the release of the long-awaited “Walking with Dinosaurs in 3-D” a film that features an array of Late Cretaceous prehistoric animals (dinosaurs mostly) with the narrator of our story being Alex an Alexornis, an ancient bird* who via a segue that manages to link the present day to the Late Cretaceous of North America, is introduced as our guide to the adventures of a horned dinosaur called “Patchi”. The fact that there were many different types of prehistoric bird around, is just one of the snippets of information that can be gleaned from seeing the film. The movie is a collaboration between BBC Earth and 20th Century Fox and although it shares the same title as the BBC’s ground breaking television series “Walking with Dinosaurs” that first aired back in 1999, this is a very different “beastie”. In the six part BBC television series, each half hour episode was narrated by Sir Kenneth Branagh, (although he wasn’t a Knight at the time), these programmes combined the BBC’s tradition for making excellent nature documentaries with ground-breaking computer generated special effects. Back in 1999, seeing a dinosaur come to life on the screen or to view a prehistoric habitat was something very memorable. After all, Steven Spielberg’s Jurassic Park may have resurrected the Dinosauria and shown for the first time how powerful CGI could be, but the back drops to the fearsome dinosaurs were all modern day locations. In the BBC television series, the programmes managed to create the effect that here was an actual nature documentary shot in the Mesozoic. Much the same look is achieved in this cinema offering, the background scenery (the location shots were taken in New Zealand and Alaska) is breath taking, however, fourteen years on, we are so used to CGI that the effects seem to have lost some of their impact. With so many fantasy films, computer programmes and in the Youtube generation, perhaps our senses have been dulled somewhat. The story seems to follow the typical plot of a film aimed very much at young viewers. An underdog, the runt of the litter gets into all sorts of scrapes and adventures before finally growing up to become a hero. There is even a love interest, yes, romance in a film all about dinosaurs, but more of that later. “Patchi” and his big brother (“Scowler”) are Pachyrhinosaurs, horned dinosaurs that are distantly related to the more famous Triceratops, but lack the impressive nose and brow horns. Thanks to an encounter with a speedy, carnivorous Troodon, “Patchi” gains a hole in his frill, which is very distinctive, a useful cinematic device to make him distinguishable from all the other Pachyrhinosaurs in the herd scenes, helpful for very young viewers so that they can follow the story line more easily. The film has been described as “infotainment”, as periodically the action is frozen and the Latin names of the prehistoric creatures and other supporting data is displayed on the screen, perhaps this is a nod to the grown-ups who can take solace in the fact that this film might have some educational value. The film is very reminiscent of Disney’s offering “Dinosaur” (released in 2000), the dinosaurs even have American accents – apt, as the action does take place in North America. The characters depicted in the film may be largely reptilian (there are mammals and birds too), but all of them have been anthropomorphosised and often they come across as mere caricatures although it is hard to consider how human-like, a two tonne, extinct Ceratopsian might possibly have been. The story jogs along at a merry pace and covers ten years in the life of the herd, time enough for “Patchi” to prove that brains are sometimes better than brawn. The dialogue can be a bit grating at times, there are all sorts of modern-day references, (as if dinosaurs, knew anything about chew toys or ninjas) and the film makers seemed to be passionately concerned with ensuring that there must dialogue for every frame of the film. For animals capable of only screeches, bellows and roars, the dinosaurs certainly do talk a lot. Do animals that lay eggs have a runt in the litter? “Patchi” with his brown eyes meets “Juniper” a female Pachyrhinosaurus from a neighbouring herd (she has blue eyes), eye colour in Ceratopsians is something that we at Everything Dinosaur haven’t actually considered. “Patchi” and his brother get separated from their herd after a forest fire, they join up with another group of migrating Pachyrhinosaurs and “Patchi” is thrown together with “Juniper”. When these young dinosaurs get lost again, thanks to an attack by a gang of Gorgosaurs (Tyrannosaurids similar to T.rex but smaller and lighter), another set of adventures begins and the love interest with “Patchi” falling head over his Ceratopsian heels for “Juniper”. The three animals have to find their own way to the winter feeding grounds. This part of the film has echoes of the “Incredible Journey” another Disney offering about three pets trying to make it back to their owners. The original “Incredible Journey” came out in 1963 with a re-make thirty years later starring the voice over talents of the likes of Michael J. Fox, Sally Field and Don Ameche. From this perspective dogs and cats seem easier to anthropomorphosise than dinosaurs. The film carries a “U” certificate, although parents of particularly young children will need to be mindful that this film does depict predators attacking, it is very much a case of nature “red in tooth and claw”. At eighty-seven minutes, the film is fractionally shorter than the “Walking with Dinosaurs” stage show, but unlike the live event there is no fifteen minute interval. To the delight of the young viewers the humour has lots of scatological references, our hero “Patchi” literally gets “dumped on from a great height” at one point. No doubt the film will do very well which then could bring about the prospect of a sequel, or indeed an entire franchise of these dino-inspired, infotainments. For us, we can always put on one of the BBC “Walking with Dinosaurs” episodes from that ground-breaking television series, which in our view are far superior. Blue-Eyed “Juniper” – Romance in the Late Cretaceous? *Alexornis is a member of the Enantiornithines, a clade of prehistoric birds that were relatively abundant towards the end of the Age of Dinosaurs. Something like fifty different species of Enantiornithines have been named so far.